Main filming's complete, and now all that's left is the editing. After a pretty good Kickstarter, J.R. Ralls is confident his Jack Chick Dark Dungeons film will be ready in time for its first showing, at Gen Con 2014. All the filming's done, and now Ralls just has to edit, edit, and edit some more until Chick's true vision comes shining through. "I hope every last one of you will be as excited and overjoyed when you see the footage as I was," says Ralls, in a Kickstarter project update. 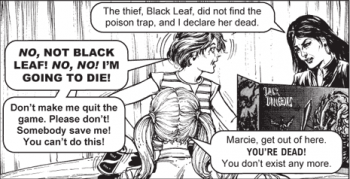 Jack Chick, for those of you unfamiliar with his unique genius, is an evangelical Christian cartoonist who claims to have sold over 750 million tracts, on all kinds of subjects. Gamers remember him best for his Dark Dungeons short, which can be seen in full over here. It was the 1980s; a simpler time, though not a happy one for the gamers out there who actually got accused of Satanism. This one should be epic, for all the right reasons. Gen Con attendees, enjoy!